Orly nail polish is 5-Free (Formaldehyde, Toluene, DBP, Formaldehyde Resin and camphor). Orly polishes come with the fan fave rubberized cap. That signature easy-to-grip topper makes it easy to control the polish. The brush is long and thin with flexible bristles. I personally would like it if there were more bristles to get more coverage in each stroke. The three cremes and peach sparkle are not technically neons, but they apply like them. They’re all thick with pigment, do not self-level, and dry satin, so a bit of finesse is required during application. I suggest loading the brush and using as few strokes as possible. That being said, I needed three coats with each to avoid VNL (visible nail line). The peach also dries a bit lumpy and has a slightly textured consistency, though a coat of HK Girl easily smoothed out all the polishes. The glitter, Feel the Funk, is a thin and easy to work with, giving semi-opaque coverage with three coats. Finally, Beautifully Bizarre is thick with pigment, but applies smoothly, delivering full coverage with three coats. Orly Beautifully Bizarre is a shell pink with iridescent blue shimmer. The shimmer can make it look more white than pink in bright light. It’s very ethereal. China Glaze Wanderlust actually looks really similar in the bottle, but you can see below that it is decidedly darker, while essie Meet Me at the Altar is darker, but also more lavender. Orly Feel the Funk is a lilac semi-sheer shimmer sprinkled with holographic glitter. The scattered holo effect reminds me of old-school Lite Brite. None of my purple glitters are quite as warm as Feel the Funk, certainly not the identically named shade by Color Club. Compared to Orly Pixie Powder, the base color is warmer and more refined due to the fine shimmer vs fine glitter. Orly Hip & Outlandish is an electric, almost-neon teal. This color is a PITA to photograph, so know that it is much more eye-searing in person. My instant reaction was that it’s an oceanic, more blue take on China Glaze Four Leaf Clover, though H&O is way more intense. China Glaze Keepin’ It Teal looks like it could be a slightly greener cousin, but its major lack of opacity killed that thought. I needed like SIX coats to get it opaque on a swatch stick. Crazy! Orly Trendy is a punchy peach packed with crystal flecks. The flecks aren’t as visible on the nail, but in direct light they add dimension and a hint of sparkle. 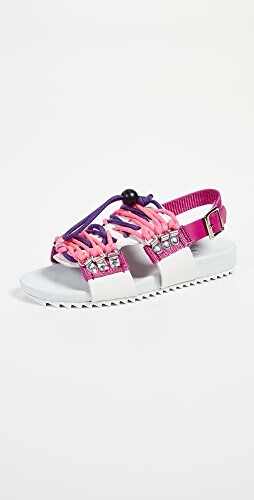 Like Hip & Outlandish, Trendy treads on neon territory and has no twins in my peach neon wardrobe. 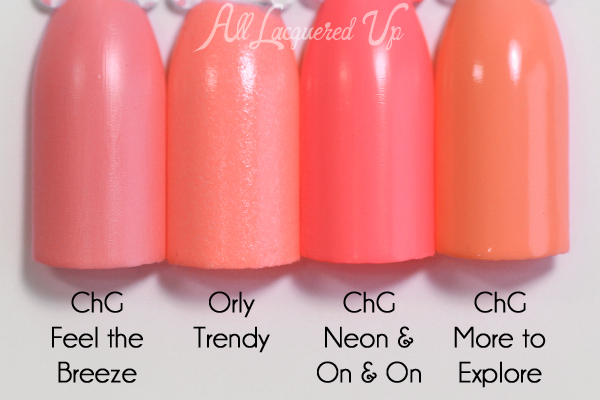 China Glaze Feel the Breeze and Neon & On & On are both more pink, while More to Explore is more orange. Orly Vintage is a pumped-up mint green, inching towards spring green. In the bottle it’s so unassuming, but really pops on the nail. I keep hearing, “It’s electrifying!” from “You’re the One That I Want,” in my head every time I look at it (so geeked for Grease: Live). Salon Perfect Mer-Made of Money is the only polish I own that looks anything like this and it’s not as green. Orly Window Shopping is a hot magenta creme with berry undertones. It’s the last of the nearly-neon shades in this collection and while it dries a bit dark and satin, once you add top coat… BOOM! It really lights up. China Glaze Escaping Reality is very, very close in hue, but because it’s not at all neon, it lacks Window Shopping’s intensity. Bottom Line: I’m really loving this color palette and the surprising way the colors pop on the nail. I also enjoy the diversity of finishes and intensity in this collection. That being said, you better work if you want those brights to look perfect. I suggest blocking out a bit of time on the first application so you can get used to the troublesome formula. 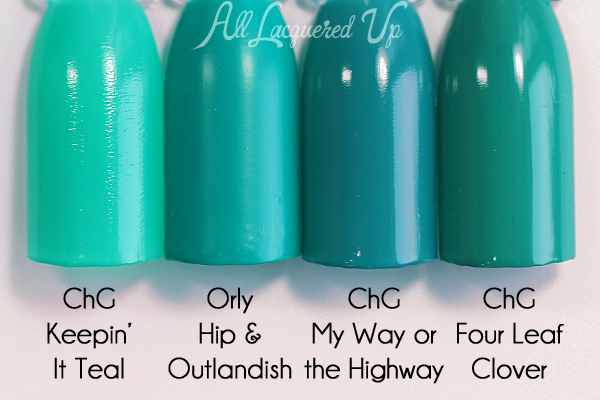 Hip & Outlandish is my fave of the bunch, especially because… NO STAINING! Window Shopping is a close second with Vintage falling in just behind. Trendy’s chunky feel makes it too much of a pain for me to want to deal with, so it gets a pass. The Orly Spring 2016 “Melrose” collection is available now at salons and mass retailers nationwide. For more info, visit OrlyBeauty.com. Orly nail polish retails for $8.50/ea. 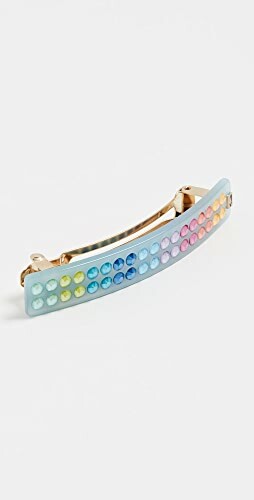 You can find the Melrose collection online at ebay.com, TransDesign.com, and Head2ToeBeauty.com. Thoughts on the Melrose collection? Do you plan to pick up any of these shades? Which nail polish collections are you most looking forward to this spring? Disclosure: Product samples were provided by reps for Orly. Affiliate links appear in this post. When you purchase through an affiliate link, you help support this site. For more info view my Disclosure Policy. Some nice colors in here! Gorgeous colors! Thank you for your honesty about the formula… it may just save my wallet from some damage this time around. I so look forward to your reviews on any collection. One because the comparisons always introduces me to new polish, and or helps me determine if I have a dupe for said particular shade. Vintage has my heart a flutter because I love aqua, and the I like trendy. However, the bumpy finish turns me off. Tfs! Damn! I might actually have to pick up some Orly’s this year! I definitely need Vintage and Window Shopping! 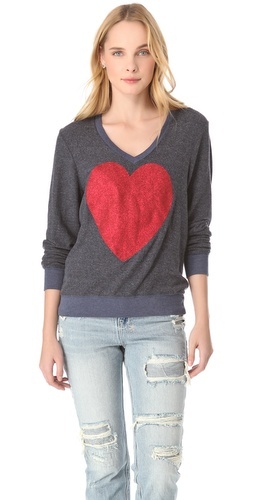 Hi, Michelle, thanks so much for reviewing this collection. I think the concept behind the collection is creative and inspiring — and Orly just doesn’t get much press on the nail blogs for some reason. I hope to see more bloggers covering this brand. I just purchased Orly argan oil cuticle drops, and it’s got to be the loveliest cuticle treatment I’ve ever used with a convenient dropper-applicator. It has a light fragrance and tends to absorb into the nails, skin, and cuticles after a few minutes; so you can rub it in and enjoy total hands softness! I plan to pay more attention to Orly in the future. Vintage reminds me of the green marshmallows in Lucky Charms cereal! Oh my, I want that glitter holo!! My favorite is Beautifully Bizarre. Such a gorgeous shell/pink. Girl I CANNOT wait for Grease: Live either. 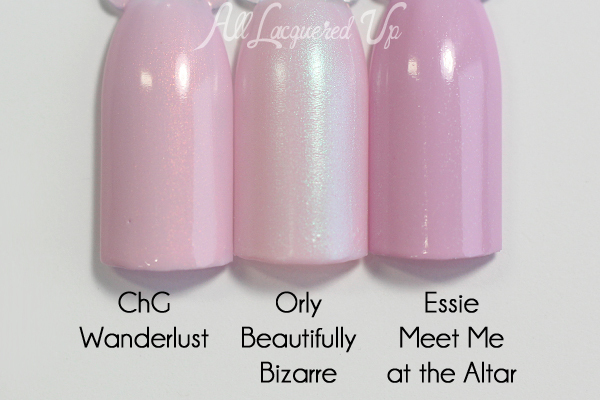 I think Julianne Hough is going to be an amazing Sandy I also CANNOT wait to get my hands on this Orly collection. Thanks so much for the swatches! Hope school is going well Michelle! This is the first nail polish spring collection that’s really excited me so far! The colors look like the regular suspects in their bottles but your pics really show the originality of each shade. 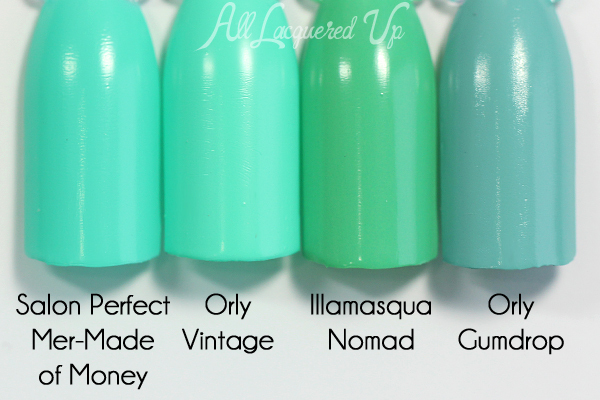 Vintage is my favorite because there’s nothing better than a punchy mint green nail. 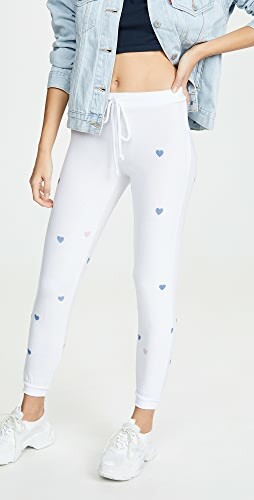 So often these look pastel or chalky, but Vintage seems like nothing I’ve owned or used. Window Shopping looks to be a fantastic no-brainer nail polish that’s universally flattering and equally gorgeous for manis and pedis; both are definitely on my list now! I think “window shopping” would look badass with a matte topcoat! Do you think that “Feel the Funk” would work as a glitter topcoat over a creme? Hi Mary! I would totally use it over another color. Just know that the base will affect the shade of the color underneath. Hip & Outlandish looks exactly like the MUA Leapfrog colour i’m wearing right now! I have done a post on my blog about it if you are interested in a low cost alternative! I am so ready for the Spring polishes. The first time I saw this collection in the press releases, I liked the peach. Too bad it’s such a pain to apply. Thank you for the added bonus of doing comparisons – even if there are no dupes, it puts the polish in perspective. A teal that doesn’t stain? 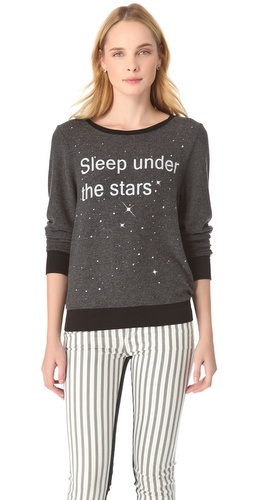 Whoa, I might have to pick this up. I can’t tell it’s nearly neon on my screen, but I’m taking your word for it! Yeah, neons are so hard to photograph and trying to photograph them under water is a pain. I adore the colours in this collection, I would love to get my hands on Vintage but gosh Orly is hard to find round these parts. I think I’ve only tried one or two polishes from the brand, I don’t know them very well. You should try ordering online. You can usually find Orly on eBay or Amazon. Sally Beauty carries the brand as well. Very interesting collection actually. At first look it seems usual but after comparison I can say it has some unique colours. As green nail polishes lover I will buy Vintage, no doubt.